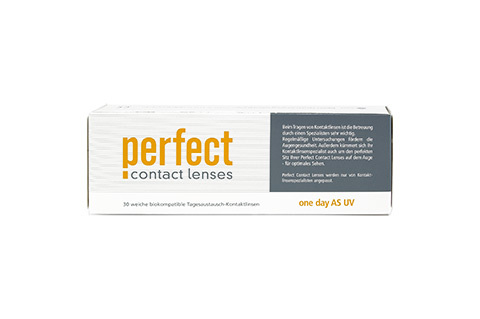 Perfect One Day AS UV is an innovative biocompatible single-use contact lens with a UV protection. The high levels of biocompatibility are achieved with a specially developed water-binding, bionic material. The natural wetting agent lies like a protective cushion between the contact lens and the cornea, removing any discomfort from the lens-wearing experience altogether. Mister Spex advises all online purchasers of Perfect One day AS UV contact lenses: the contact lenses, Perfect One day AS UV, should always be fitted to your eyes by an eye doctor or optician. The period between fittings, unless otherwise prescribed by an eye doctor or optician, should not exceed 6 months. You should go for regular check-ups. The manufacturer MPG&E/your eye doctor/optician's recommended wearing time for Perfect One day AS UV contact lenses should be followed strictly. It is your own personal responsibility to make yourself aware of the care instructions for Perfect One day AS UV contact lenses and to follow them accordingly. In case of eye irritation or visual impairments caused by Perfect One day AS UV, remove the contact lenses immediately and consult an eye doctor or optician. Damaged contact lenses should be replaced immediately.